House of Doolittle Executive Desk Pad Calendar - 24" x 19"
Block Size: 3.25" x 2.50"
Media Size: 24" x 19"
Dated January through December one-page-per-month desk pad calendar features lightly ruled daily blocks and two previous months, current month and four months ahead reference on each page. Includes Julian dates with days remaining. Monthly pages are printed in three alternating colors on recycled paper made with 30% post-consumer material. 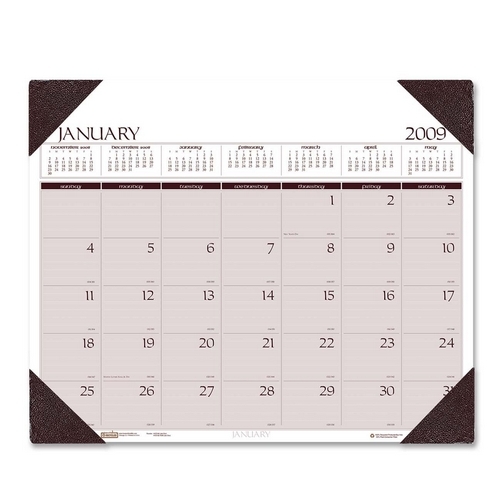 Desk pad has brown simulated leather binding with matching corners.